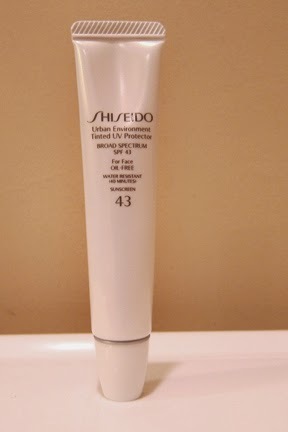 THE SKINNY: If you're looking for a tinted moisturizer that protects from sun, UV and environmental damage, Shiseido Urban Environment Tinted UV Protector might be for you. I like the extreme lightness of this moisturizer. It's almost runny, which makes it easy to apply in hot weather. It covers evenly and provides an amazing SPF 43. It's water resistant for about 40 minutes, Shiseido says. This is a great tinted product for days when you need light coverage. It's not dewy. It won't help hide blemishes. It will blend into your natural skin tone. And it will help protect your skin from a bright and sunny day. Who can complain about that? CHECK IT OUT: Shiseido Urban Environment Tinted UV Protector comes in three shades. Get Paid to Shop; It's FREE! We are on Facebook. Share your beauty tips, tricks and suggestions. And find out about new giveaways first! Copyright 2011-14. Information is not provided by companies unless noted. Awesome Inc. theme. Powered by Blogger.